The Royal Australian Air Force is undertaking an engineering review of the PC-9/A fleet that supports flying training and the Roulettes. Like all Air Force aircraft, the PC-9/A is subject to regular maintenance and engineering reviews. These engineering reviews have located cracks in the nose-landing–gear folding strut. Consequently, Air Force is assessing the implications of these cracks, so as to ensure the aircraft meet Air Force’s strict safety standards. 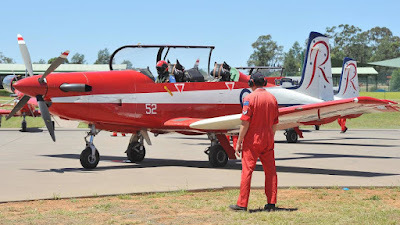 Therefore, as a precautionary measure, each PC-9/A will undergo an additional engineering review, and remediation repairs, before returning to normal flying activities. Safety is a priority for Air Force operations. Air Force aircraft are serviced and flown under a very strict and controlled airworthiness and safety system. All aircraft are under constant surveillance to ensure that they maintain the highest standards. Regrettably, this will mean some appearances by the Roulettes must be cancelled. While this is disappointing for both event organisers and the community; the safety of our personnel and the public takes priority. As the aircraft are reviewed and return to flying, Roulette displays will resume.